Welcome home to this beauty with an expansive lot and peaceful lake view. Updates Galore! The work has been done! This home is updated inside and out starting with the new roof! Upon entry there is new wood look tile flooring in the entry, the formal dining area and living room. A gourmet kitchen is remodeled with beautiful wood cabinetry, quartz counter tops, new stainless appliances, wine cooler, lighting and mill work. Both the master bath and guest bath have been remodeled with new cabinetry, counter tops, fixtures and tile. The pool and deck has been resurfaced and new pavers. To keep you cool there is a new AC unit. 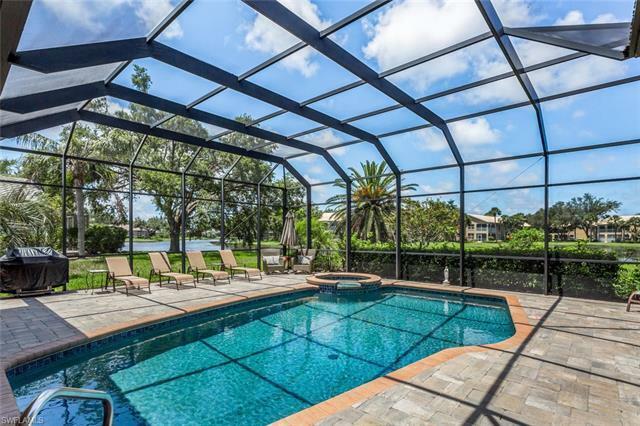 Since the work is done and the home can be purchased furnished, you can enjoy yourself pool side while watching lake wildlife. Pelican Landing offers all your favorite amenities such as private beach and shuttle, equity golf, excellent tennis facilities, community facility with fitness, Pelican Nest Golf Club, canoeing and more.